Ah more inspiration posts. Unfortunately, however, I will be unable to apply any of this tomorrow. We have weird homeroom contests? Where we have to like...be athletic? Which is um, not exactly my prime..subject? Is that what they say? Anyway point is AAAFLARRRGEEEGARG. Oh right happiness. Basically these are all about that warm color scheme...which was more fitting when I made these back when it was actually Fall...and not 8 DEGREES LIKE IT WAS TODAY...but, um, yeah. And, once again, these are a few months old..so if you know the photo sources just holler? 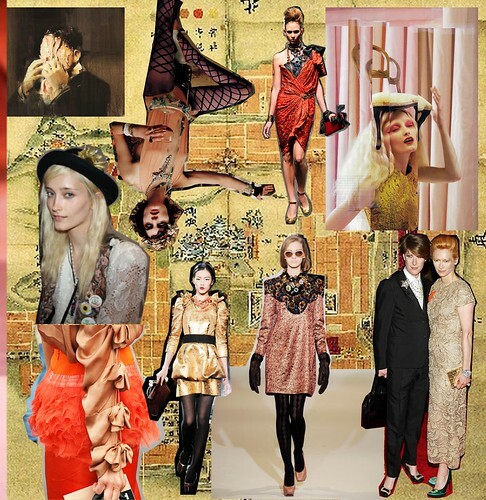 All runway photos style.com. Background is a supa-old map of the Himeji castle, says Wikipedia. I googled "old map" and it came up. Cool. Painting by Adrian Ghenie, something from an old editorial from a magazine I don't remember, Lanvin Spring 2010, Iekeliene Stange (I swear, for the LONGEST time I thought her last name was Strange) in crazy theatrical chairs-on-head editorial in current issue of Pop, Tilda Swinton in THAT lace Prada dress with Justin Bond BOTH LOOKING SO GOOD, Marni Fall 2009, Dolce & Gabbana Fall 2009, Anna Dello Russo's arm and waist via Jak & Jil, Iekeliene Stange at a party via style.com. Background is Ryan McGinley's Moonmilk. 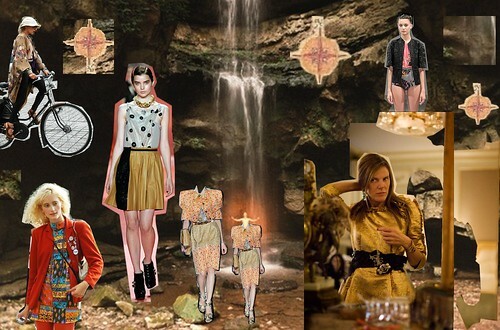 Clockwise from upper left: the RIDICULOUSLY UNFAIRLY AWESOME Catherine Baba biking in one of the most fantastic outfits ever via Jak & Jil, Peter Som Spring 2010, Anna Dello Russo shot by Garance Dore (and I'm pretty sure she's wearing the gold Dolce from collage numero uno? ), Dolce & Gabbana Spring 2009, 3.1 Philip Lim Spring 2010, Iekeliene Stange having awesome personal style yet again via Jak & Jil. The pictures here are less cohesive than the first collage, more about the colors. I don't think I've ever talked about how Iekeliene, Anna DR and Baba are three of my favorite Fashion Week followers. They ALWAYS look so damn good. Like I said, Iekeliene is kerazy. And Anna reaches a level of elegance beyond you or me, unless "you" are Anna Dello Russo, in which case, HI HOW ARE YOU! And Baba drapes like a nut. She looks like a living room from my art teacher's book from the 70's entitled Underground Interiors. Also, the fact that I own the issue of 10 with the shoot styled and modeled by Baba makes me proud. Well that's all for tonight folks. And, again, wish me luck with both the sports and dressing for playing sports part of tomorrow.